The Mtb Course holiday on the Italian Riviera offered by Nyala Wonder Travel gives you the chance to pedal along paths that only real Mountain Bike enthusiasts would appreciate. There is a wide range of breathtaking scenery to discover, not to mention the impeccable organization of hotels, transfers and everything you need for the perfect holiday. The San Remo MTB Week is the occasion to explore the wonderful panorama of the Maritime Alps, a one of a kind place where within a few kilometers you can move from the beaches of the Ligurian Sea to peaks of over 2000 meters. 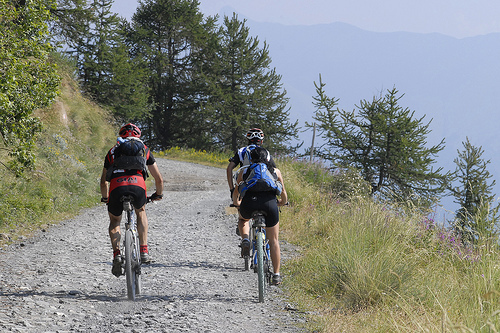 With our guides, experts in mountain biking, you’ll embark on the discovery of the valleys and the mountains that frame the Flower Riviera, enjoying the landscapes and the surrounding natural beauty, visiting thousand year old medieval villages and tasting the typical products of Ligurian cuisine. After an initial day of orientation to evaluate the level of training of the participants, the itineraries proposed in the program will be adapted according to the abilities of the group. The level of each stage is indicated in the schedule of each excursion. Arrival in the afternoon with accommodation at the Nyala Suite Hotel. Free for dinner. After dinner we suggest a peaceful evening walk along the illuminated streets of the city or, alternatively, you can try your luck at the gaming tables of the Municipal Casino. Return to the hotel and overnight stay. One of the most panoramic cycle tracks in Italy, the only major route that offers a constant view of the Ligurian Sea. The path in question is located on the old railway line route, recently moved towards the mountain, and it also includes some long (illuminated) tunnels . There are many rest stops along the route. The climb towards Cipressa along cross-country style paths are clearly marked and sign-posted. Sea and mountain views and local architectural features (church of Cipressa, the village of Lingueglietta) can be seen along the way. The second part of the route is almost entirely unpaved. A visit to the old chestnut tree with a monument dedicated to the Nobel Prize winner Giulio Natta. A climb along the Valle Argentina up to the turning point for Vignai, where you can see some vestiges of the aqueduct, an important historic installation, designed in 1883 by the Eng. Cav. Giovanni Marsaglia and inaugurated after two years, extended and renovated several times over the years. Descent through firebreak paths and trails towards Oxentina. Return to Taggia (notable for the artistic value and extent of its historic center). Meeting point: The covered market of Taggia (end of the Arma – Taggia road) at 9:00, return in the afternoon. A break from your beloved bike and a free day for leisure. For all those who wish, we offer the opportunity to visit the famous Principality of Monaco. Outward trip by train, visit and lunch at the “Rocca”, with the possibility to visit the Prince’s Palace and the Oceanographic Museum. In the afternoon a walk around Porto Hercule, the piazza, the gardens of the Casino and Princess Grace promenade, to arrive at the path overlooking the sea that leads to Cap Martin. Return with transport from Menton. A journey of discovery of the ruins of the cableway that has fallen into disuse, and of the highest peak located in the commune of San Remo (1299 m.). Inside the urban park San Romolo of Monte Bignone you can find various species of flora, which range from typical Mediterranean scrub to Scots pines and beech trees. The descent winds along trails that should be attempted with great care and attention. Return directly to hotel. Meeting point: Prato di San Romolo at 10:00 by shuttle, return scheduled for 15:00. Along the Imperia slope the first part of the climb winds on asphalt up to the church of St. Brigida, then onwards by dirt road. You have the possibility of reaching the summit where on clear days there is a breathtaking view (1149 m.). A visit to the “Casone dei Partigiani”. Descent in All-Mountain style on single track or on dirt roads. There are many points of architectural interest as you pass through centers like Sasso, the Principality of Seborga and the historic center of Bordighera Alta. We suggest a visit to the Blancardi biodynamic wine company. The magnificent views along the sandy fire break trails are equally impressive; you can catch stunning glimpses of the sea surrounded by low vegetation. Finish at Capo di Sant’Ampelio and the famous church. After a hearty breakfast, the morning is free for you to visit the wonders of San Remo, the old port, the magnificent gardens of Villa Ormond and Villa Zirio, the famous Villa Nobel and the elegant streets of the city center. Departure for the place of origin. * In case you are traveling alone, you can choose between paying the single supplement or sharing the room with another participant. Round trip travel, transfer to the places indicated in the program, except where otherwise specified, and anything not included in “Our offer includes”. Lunches and dinners must be selected according to the daily menu or the tasting menu proposed by the chef. Beverages and à la carte items must be paid for on site, except where otherwise indicated.